Another great trip! I have gotten to go with University of California at Irvine medical students to Tanzania for 3 years as their supervising MD. They do all of the work, pretty much, preparing lesson plans to teach clinical officer students basic ultrasound as well as designing study protocols, getting institutional review board approvals, and carrying ultrasound machines on fatigued shoulders through multiple airports. I get to teach them a bit about clinical medicine, field questions that they couldn't possibly answer and flaunt the MD on my nametag. UC Irvine teaches their medical students, starting in the beginning of the first year, how to do ultrasound at the bedside, which cements their knowledge of living anatomy and gradually expands during their 4 years to competence in recognizing all kinds of diseases which have ultrasound findings. 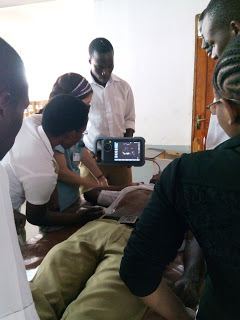 This group of students is comfortable teaching basic ultrasound to their African counterparts, who are amazingly knowledgeable in anatomy and physiology. The African students get 3 weeks of lectures and daily hands-on sessions, learning how to get good ultrasound views of the heart, lungs, abdomen and even the womb in pregnancy. Having a cadaver to dissect is apparently a luxury not available to these students, so ultrasound is their first opportunity to actually see inside a human body. Unfortunately 3 weeks is not nearly enough training to become competent in performing and interpreting ultrasounds, but these students will never be afraid to take the steps necessary to learn more, and they will never forget how the heart looks when it beats and how the liver, spleen and kidneys nestle close to each other at the peritoneal reflections. There are ultrasound machines in Tanzania, and few people who know how to use them. There are not enough ultrasound machines in Tanzania, at least not ones that work, but as the technology gets cheaper, the older machines will be even cheaper, and if there are people who understand how powerful the technology is, they will buy them. The teaching project will not create radiologists, but it will make general practitioners push medical practice in the direction of including more bedside ultrasound. In my experience, this will save lives and reduce suffering. Beside improving their understanding of anatomy, after 3 weeks most of the clinical officer students who were in the ultrasound class had skills which could have profound clinical impact. If provided with a functional ultrasound machine, they could determine the age of a fetus, the position of the placenta and the head, and determine the fetal heartbeat, an important indicator of fetal health. This information could result in appropriate referral for caesarian section, potentially saving the lives of both the infant and the mother. They could identify a pneumothorax in a patient with a traumatic chest injury, which would be easily treatable if found in time and maybe fatal if missed. They could identify bleeding into the abdomen or chest in patients who presented after motor vehicle crashes, which are terrifyingly common. They will be able to look at an ultrasound picture and see more than a bunch of blurry gray, black and white shapes. This project is cool in so many ways. I love that students teach students. The process is very gratifying and makes the material even more exciting. The UC Irvine med students are now completely awesome at basic ultrasound, and they were only just good when we started. The teaching goes both ways. The African students have an accelerated curriculum so they teach the UC Irvine students things they don't know, as well as asking questions that make all of us think harder. I have done overseas projects which directly help people in need, which is wonderful in its way, but this project potentially has legs. Teaching medical practitioners to be better at their jobs is really powerful and has the ability to affect the lives of many patients. In teaching what they have just learned themselves, while they are still excited about it, the U.S. medical students show the Tanzanian ones how to be teachers of each other and to love learning, which could end up being as important as what they actually teach. In Tanzania, medical students work incredibly hard for the opportunity to continue to work incredibly hard in overcrowded hospitals and clinics with inadequate resources. It feels like this project may make them just a little more effective and a little bit happier in the process. 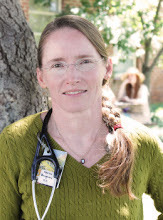 Labels: guest post , Janice Boughton , medical education , medicine in foreign countries , Why is American health care so expensive?